What And Where Is The Rio de la Plata? The Rio de la Plata estuary, between the South American countries of Argentina and Uruguay, houses enormous populations of humans alongside diverse wildlife. NASA photo of Uruguay and Paraná Rivers merging into the Río de la Plata estuary, which in turn is flowing out into the Atlantic Ocean. 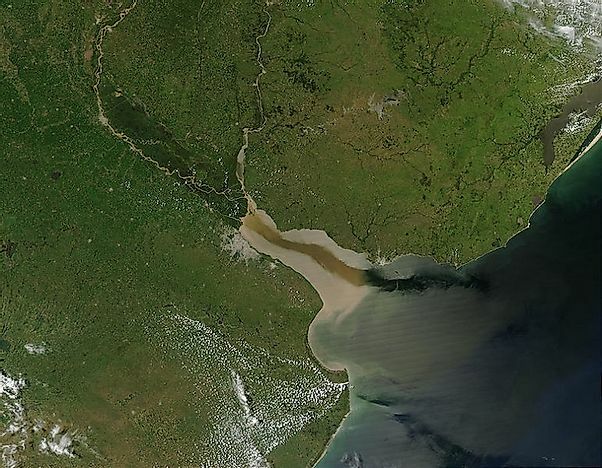 The Rio de la Plata is a funnel-shaped estuary formed by the confluence of the Uruguay and the Paraná rivers on the east coast of South America . The waters of the estuary drain into the Atlantic Ocean. The head of the Rio de la Plata is comprised by the delta of the Paraná River and the mouth of the Uruguay. The estuary extends for a distance of 290 kilometers, widening out with decreasing distance from the sea, ranging from being about 2 kilometers wide near its source to nearly 220 kilometers wide near its mouth. The Rio de la Plata forms a natural border between the South American countries of Uruguay and Argentina, and the surrounding lands are some of the most densely populated areas for each of these countries. Many significant port cities of Argentina and Uruguay, as well as their respective capital cities of Buenos Aires and Montevideo, are located along this estuary. Prior to the arrival of Europeans, the land in and around the Rio de la Plata area was occupied by the indigenous people of South America. The first detailed exploration of this estuary was carried out by Spanish and Portuguese explorers in the 16th Century. Sebastian Cabot was the first to create a detailed map of the Rio de la Plata region, doing so after navigating through the estuary for trade purposes between the years 1526 and 1529. With the introduction of modern agricultural methods and expansions of trade along the estuary, soon human settlements were better allowed to flourish along the banks of the Rio de la Plata. With the end of European colonial rule in the region, several of the newly formed independent South American countries focused their attention towards the control of the promising land around the Rio de la Plata for themselves. The Argentine Civil War, the Cisplatine War, the Platine War, the Paraguayan War, and the Chaco War were all fought between South American countries with a focus on controlling the abundant natural resources present in and around the Rio de la Plata. The Rio de la Plata region is currently home to some of the most densely inhabited regions of both Argentina and Uruguay. Nearly 70% of Uruguay’s population lives close to this region. South America’s largest port and Argentina’s capital city, Buenos Aires, lies on the western banks of the estuary, and 96% of the country’s coastal traffic is handled by this single port city alone. Large volumes of Argentine and Uruguayan meat and cereal exports are handled by the ports located along the Rio de la Plata. The industries required for processing such export products are also built along the banks of this estuary. The nature reserve of Reserva Ecológica Constanera Sur, just east of Buenos Aires, is a tourist hot-spot as well. This unique wetland ecosystem, with its wide range of flora and fauna, attracts tourists from all over the world. Over 500 species of birds can be spotted in this protected region. The Rio de la Plata supports a wide variety of plant and animal life. The Upper Paraná river zone, to the east of the Rio de la Plata, supports the growth of forests rich in such evergreen trees las the Paraná Pine. The lower reaches of the Paraná Basin is mainly comprised by vast tracts of grasslands, after mostly being cleared of trees for animal grazing and crop cultivation. The Paraná River Delta and the estuary region of the Rio de la Plata support typical flora of a South American wetland ecosystem, like the water hyacinth, the Amazon water lily, and guama, just to name a few. Some important animal species of the Rio de la Plata ecosystems include the rare and "vulnerable" La Plata dolphin, jaguars, tapirs, and ocelots, along with several species of the Rio de la Plata's turtles, which include the likes of the "vulnerable" Loggerhead sea turtle and Leather-back sea turtle, and the "endangered" Green sea turtle. Besides turtles, other reptiles such as the caiman, rattlesnakes, iguanas, and Cross vipers, as well as a number of amphibian species, also thrive in the Rio de la Plata region. 350 fish species, of which 85 are endemic, are found in the La Plata Basin as well. These include such fish as the carnivorous piranha, the pacu, the Dorado, catfishes, and the manduva, all of which are abundant in the waters of the estuary. Nearly 650 species of birds nest in this region as well, including a variety of parrots, eagles, and kites. Even though a large number of people are dependent on the waters of the Rio de la Plata and its rivers for their domestic water consumption, the pollution of these same waters from industrial wastes and sewage, as well as pesticide and fertilizer run-offs from agricultural lands, has led to a sharp decline in the water quality here. Large scale deforestation of land, and the use of mechanized agricultural practices, along the course of the Uruguay and Paraná Rivers has triggered soil erosion and sedimentation throughout the Rio de la Plata Region. Introduction of non-native species from Asia and Africa, like golden mussels, into the waters of the Rio de la Plata by ships harboring these species in their hulls, chains, and keel further threatens to replace the native aquatic flora of the wetland ecosystem. Such invasive secies are disturbing the food chain, and thus displacing the native species of the region and their ecological roles.